The new Vacheron Constantin Metiers d'Art Villes Lumieres collection is an invitation to embark upon a nocturnal journey above cities bubbling with creativity. On dials draped with an enamelled base in deep shades, a wide variety of powders creates a bird's-eye view miniature tableau of these sprawling urban expanses. Traditional Grand Feu champleve enamelling mingles with hand-applied precious powder, an art never yet used in Fine Watchmaking. The striking and realistic beauty of these Hallmark of Geneva certified timepieces opens up whole new artistic and creative horizons, where traditional skills are constantly nurtured by fresh influences. The Maison has dreamed up a sparkling encounter between two exceptional arts: Grand Feu champleve enamelling, a skill passed on for almost three centuries by the Vacheron Constantin artisans; and hand-applied precious powder, a technique mastered by Japanese guest artist Yoko Imai. This is the very first time that this technique has been used on a watch dial to which particles of gold, pearl, platinum and diamond powder are meticulously distilled one by one, endowing the enamel with exceptional radiance. The bright dots of light, placed with the greatest precision, compose a portrait of these broad and majestic urban landscapes. The light effects play across these strikingly realistic roads, rivers and famous landmarks. Certified by the prestigious Hallmark of Geneva, the Metiers d'Art Villes Lumieres watches beat to the rhythm of a mechanical Manufacture Vacheron Constantin caliber graced with refined finishing, in accordance with traditional Fine Watchmaking techniques. The first models in this new collection are dedicated to the nocturnal magic of Geneva, Paris New York and Beijing. As time goes by, this night-flight will continue over other cities. 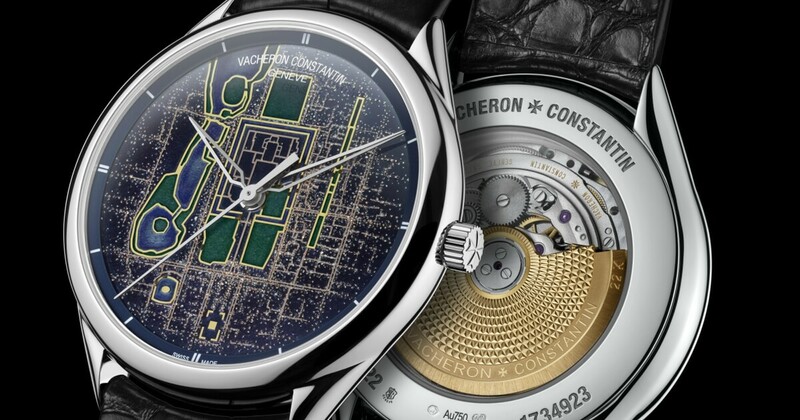 Vacheron Constantin has depicted major cities - notably renowned for their artistic influence -through their nocturnal panorama. Individually applying precious powder particles naturally implies extreme dexterity, and doing so on the surface of a watch involves the additional constraint of defining an ideal altitude for each city so as to convey realistically the emotional impact of its urban outlines. The miniature tableaus that Yoko Imai has composed faithfully reproduce the real 'light cartography' of the cities, with their various sorts of light, such as variously animated districts and even traffic density! This incredibly meticulous work on the map of each city called for several weeks of research and trials on various base materials. 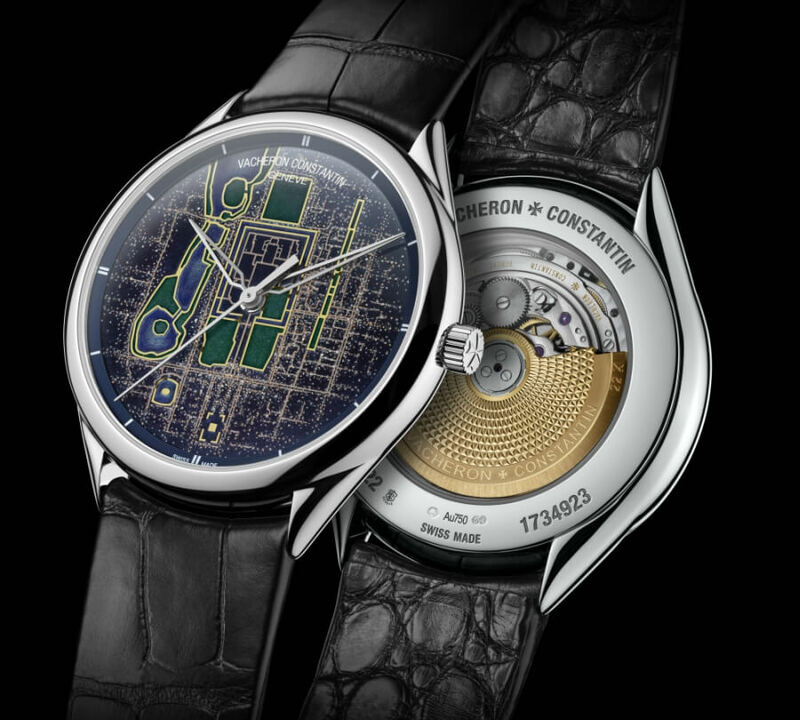 For each of the dials, the Vacheron Constantin master enameller first examined the possibilities afforded by champleve in order to highlight the shapes of the streets, gardens and stretches of water. After hollowing out the gold dial by hand according to the chosen outlines, he then applied successive layers of translucent coloured enamels. Between each coating, the dial is fired at the extremely high temperature of 850°C. These crucial and delicate stages, masterfully guided by intuition and governed by stringent discipline acquired over time, enable the powdered glass mixed with colouring oxides to be melted, transformed and then vitrified by cooling - with the inevitable risk that the dial may crack or flaws may form. In the Metiers d'Art Villes Lumieres collection, the master enameller has taken up the additional challenge of composing subtly translucent and dark shades in order to reproduce the singular night-time atmosphere. Vacheron Constantin invited the Japanese artist Yoko Imai to associate her art with that of the enamelling artisan. Trained by the great Japanese masters, she has developed her own artistic technique: calligraphy-inspired painting on canvas, inspired by precious powder. For Vacheron Constantin, she has for the first time adapted this process to the enamel of a watch dial, while creating a fascinating chiaroscuro effect. To ensure a faithful transcription of the city lights, her deft hands are guided by absolute mastery, unwavering concentration and a special sensitivity. requiring a particular form of concentration and sensitivity. The technique of applying precious powders borrows a fundamental principle from the art of calligraphy: the quest for balance and purity. Using a thin stylus, the powder particles are individually affixed using a technique that remains a jealously guarded secret. The luminous magic of the completed tableau depends on this extremely rigorous approach: each fragment is perfectly positioned in its rightful place and there is no room for anything random or superfluous. Each of the powder specks is thus chosen according to its size and its shimmer, then worked on from several angles and with various types of light, so as to ensure enhanced radiance and realism. First of all, tiny gold grains form the luminous backdrop. Then diamond and platinum powder are successively applied to create shiny and dark effects, punctuated by pearl spangles. Their varying brightness makes it possible adjust the direction and size of the luminescent areas, in order to infuse the dial with life and warmth. On the enamel base, between the raised gold ridges, tens of thousands of spangles shine in the light. The particles of precious powder, all of varying shades and degree of luminosity, interact both amongst themselves and with the dark shades of the Grand Feu enamelled background. The radiance of the composition is more intense in the dial centre and gradually softens towards the outer edges of the dial. Hand-crafted during more than three months and born from a mingling of artistic crafts, each dial is truly unique. A magnifying glass provided in the presentation box of the timepiece provides a chance to admire the workmanship in all its glorious detail. The flyover begins with Geneva, the cradle of technical and precious watchmaking, renowned for having nurtured the art of miniature painting on enamel. Vacheron Constantin was born in the heart of the town, in the St-Gervais district, where the cabinotiers had their workshops. Then comes Paris, the "City of Light" par excellence, a favourite among artists, philosophers and writers, known the world over for the inimitable elegance of its style. The aerial view of the capital retraces the life of iconic landmarks such as the Place de l'Etoile and the Champs-Elysees, the Seine, as well as the Eiffel Tower famed for its light effects, viewed from above and engraved in gold. The journey continues with New York, the city that never sleeps, a symbol of dreams and effervescence, where everything is possible. Reproducing it stretches the technique of applying precious powders to its absolute limits, with the highest vantage point that could possibly be depicted. Sprinkled across the Grand Feu enamel, tens of thousands of precious dots animate the luminous outlines of Manhattan Island with Central Park, the Hudson River and Brooklyn. Finally, the twinkling lights of Beijing appear. The shimmering glow of the Imperial City viewed from above carries a hint of its manifold splendours testifying to a proud history. The more intense halos of certain monuments, landmarks and particularly animated streets surround the vast Forbidden City, which remains less brightly lit and more mysterious. 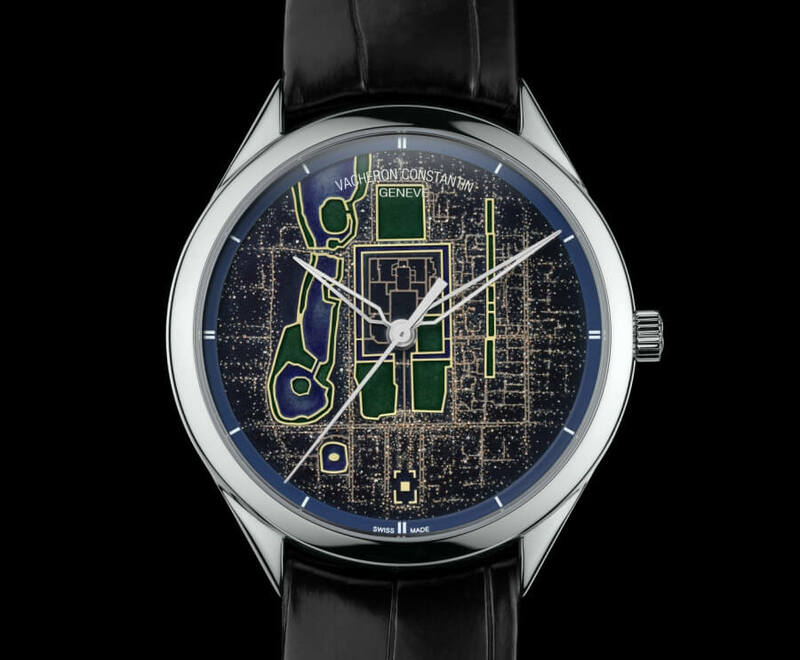 The Meridian Gate, the Gate of Heavenly Peace and Tian'anmen Square can be distinguished on this meticulous cartography composed of enamel and precious powders. The timepieces of the Metiers d'Art Villes Lumieres collection are certified by the Hallmark of Geneva, a sure token of precision and reliability issued by an entirely neutral and independent body. Manufacture Vacheron Constantin mechanical self-winding Caliber 2460 SC drives a display of the hours, minutes and seconds. Visible through the transparent case-back, the 22K gold oscillating weight features a finely executed decoration inspired by the Maltese cross, the Vacheron Constantin signature emblem. Each of the components, whether visible or hidden, is adorned with finishes crafted in accordance with the finest watchmaking skills exemplified by bevelling, circular-graining and polishing. The movement is protected by a precious white gold case. The Metiers d'Art Villes Lumieres collection is a horological and artistic creation in keeping with the purest Vacheron Constantin traditions. 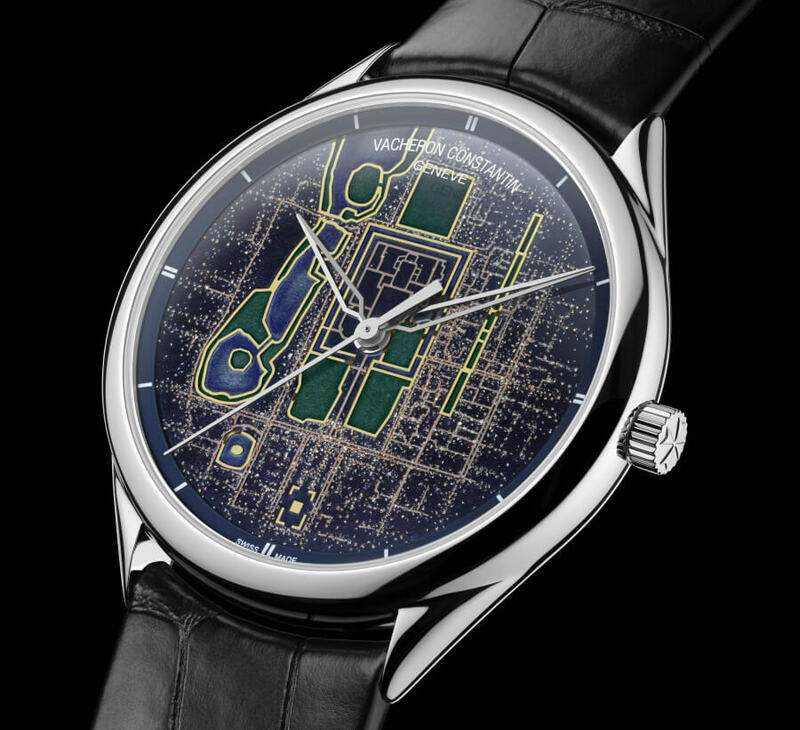 Its striking dials, like authentic miniature tableaus, offer an original view of fascinating cities and of the watchmaking art itself, perpetually inspired and constantly reinvented. The Vacheron Constantin Metiers d'Art Villes Lumieres collection is powerd by 2460 SC Calibre. Developed and manufactured by Vacheron Constantin Mechanical, the self-winding movement has 26.2 mm diameter and 3.6 mm thick. It has an approximately 40 hours of power reserve and runs at 4 Hz (28,800 vibrations/hour). The 2460 SC Calibre has 182 components and 27 jewels. The 18K gold case has 40 mm diameter and 8.9 mm thick with a water-resistance tested at a pressure of 3 bar (approx. 30 meters). The name of the city is engraved on the back of the timepiece.